‘Where are you going this time Lisa?’ ‘I’m traveling to Bonaire.’ ‘WHERE?’ That was the first reaction I received from everyone. No one knew this place existed. So, get excited to read the story about my Bonaire adventures, a little island in an area that is known as the ‘Dutch Caribbean’. As the name implies, Bonaire is indeed Dutch territory and KLM flies to the so-called ABC islands (Aruba, Bonaire, Curacao) frequently. I boarded my flight in Hamburg with my final destination ‘Flamingo International’ via Amsterdam. 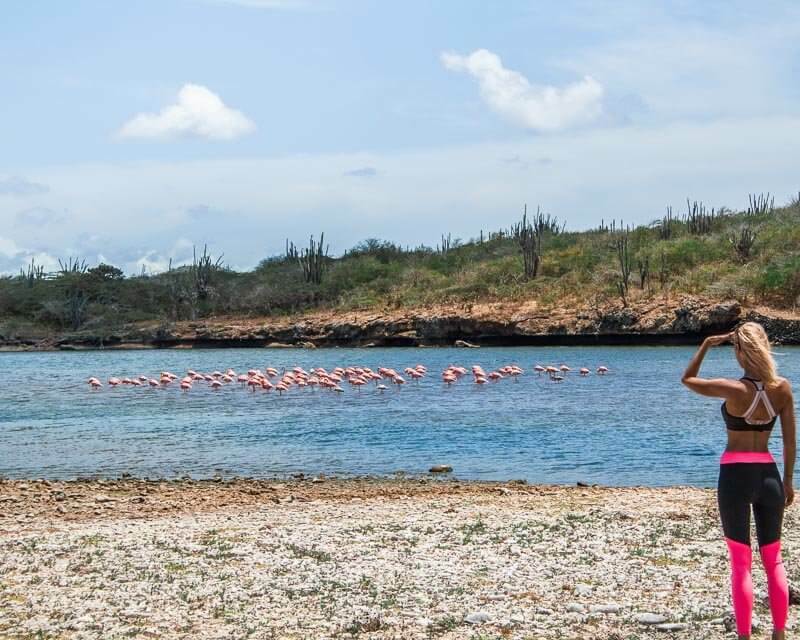 Yes, you’ve heard right, the official name of the airport on Bonaire is ‘Flamingo International’. And believe it or not, the airport complex including the tower are pink. The moment you arrive you know that you’re setting foot on Flamingo territory. 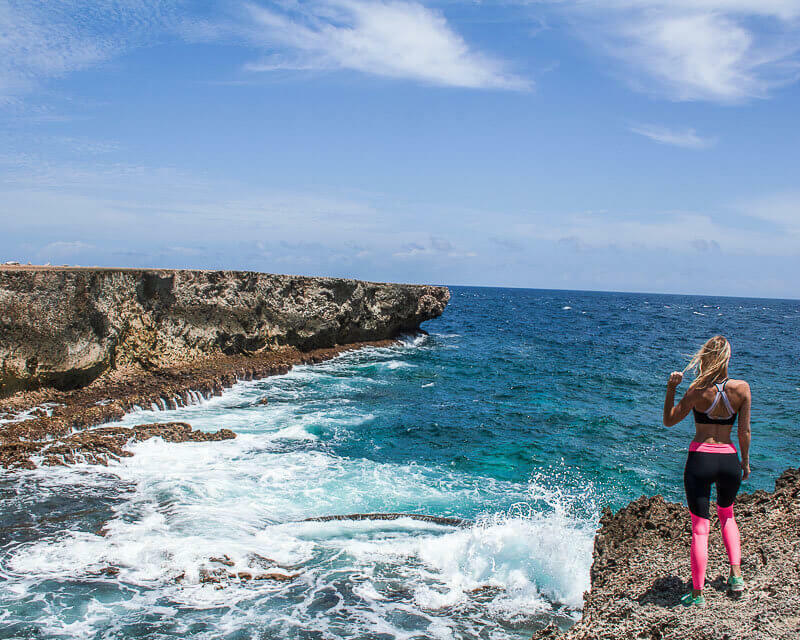 Let the Bonaire adventures begin! There is a number of hotels that offer very good travel deals. I could have also stayed at a friends condo that they rent out at Harbour Village. Accommodation on Bonaire in general is fairly expensive though. So, I decided to book an AirBnB apartment and I might have found THE best place on the island. My lovely hosts even picked me up from the airport. At the apartment, I was greeted by a crab who had crawled up to my door with his shell house. Lovely Jolanda just commented with ‘Oh that little bugger keeps moving around in the garden!’. Hello island feeling! I just love staying at AirBnB places. It always gives you a local feeling and I already felt like a part of the island within my first days. One day on the way back from watching the sunset, a neighbor even greeted me assuming I was living in the neighborhood. My place was called ‘Hammock Studios at Bachelor Beach’ which I can recommend a million times. There is another AirBnB place right at the cliffs which also looked pretty cool if you’re looking to check out more options. Both places have three apartments which is perfect especially for someone like me traveling solo. You’ve got someone around to chat with yet still all the freedom and relaxation you’re seeking. Another way more fancy option is the Delfins Beach Resort. It’s a beautiful resort with a stunning private beach. They just opened last year so there are still some good promotion deals going on. If you’re staying somewhere else but only want to spend a day at Delfins you can always get a daily pass for 30$. Well, I basically always snuck in without paying anything since my dive shop was located there. A bit cheaper option will be ‘Beyond The Corals’. They also offer ‘Stay&Dive’ packages. Also, in Kralendijk there was this cute blue apartment garden, called ‘Blachi Koko Apartments Bonaire’, I always passed by when cycling to town. It looked worth checking out as well. You will definitely need to get a rental to get around. 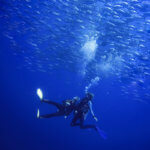 Since Bonaire is the #1 destination for diving, a lot of hotels offer ‘Drive&Dive’ packages. I wanted to save some money and decided for the cheapest option, renting a mountain bike. Yup, that might sound a bit crazy but who knows me knows nothing is really too crazy for me. Or in other words ‘Lisa, everybody says it’s too windy to get around the island on a mountain bike’ Well, I am certainly not ‘everybody’ haha! I was glad though my host offered me a ride to the supermarket on my first day. My original plan to load the bike with all the groceries would have been a complete failed mission. Pick up is convenient as the rental company delivers the bike to your accommodation. Well, the guys never picked the bike up again though so I actually left the island while the bike was still parked in our garden, too bad. I guess that’s another local vibe you’re experiencing. My dear mountain bike probably allowed me to experience one of the most incredible moments of the whole trip. The wind in the South of the island was really challenging. And while I was busy fighting that ‘hurricane’, I saw something pink on the right. It was a swarm of flamingos flying right next to me. So there I was, completely alone, fighting the strong winds, listening to the big ocean waves crashing towards shore, being accompanied by a swarm of flamingos. There are no words to describe this moment. For the last three days, I got myself an old jeep to enjoy some jeep cruising on my last days though. We had some very intense three days together as I basically took my awesome jeep everywhere. We also fought through tough times when he decided to have a flat tyre halfway in to the national park. Luckily, there were locals around who came running to help me right away. I loved that car as it was the perfect addition to complete that local feeling I was already experiencing. Writing these words I have such a big smile on my face thinking back to those moments where I felt the speed of my jeep and the sun on my face while the island breeze was blowing through my hair. 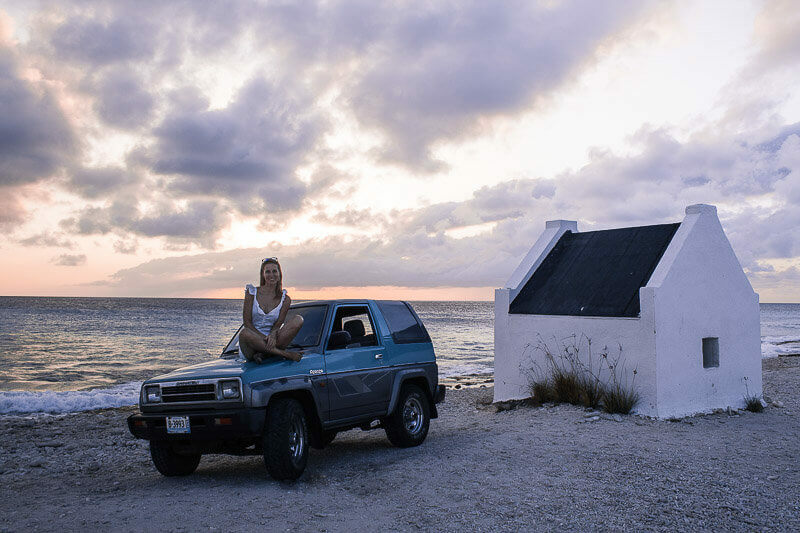 Bonaire Adventures and what to do? There are several things you can do on the island. Of the three ABC islands Bonaire is known as the most relaxed one. Aruba and Curacao tend to be more touristy. I was really looking forward to a relaxing time on a laid-back island with a local vibe. 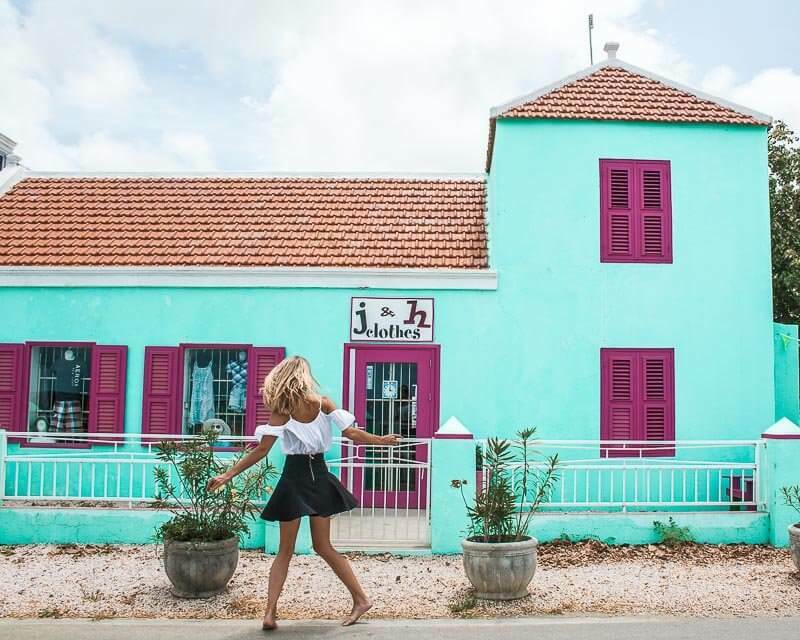 The beautiful thing about Bonaire is that you are completely free to do whatever you feel like. You can go kite surfing or diving. You can spend all day going windsurfing and hanging out at Jibe City which is the windsurfers’ meeting point. Or you can go to one of the several breathtaking beaches or beach resorts, e.g. Windsock Beach Club (entrance free). Or you can be active and book a tour to the mangroves or kayak over to Klein Bonaire, a little island right next by. 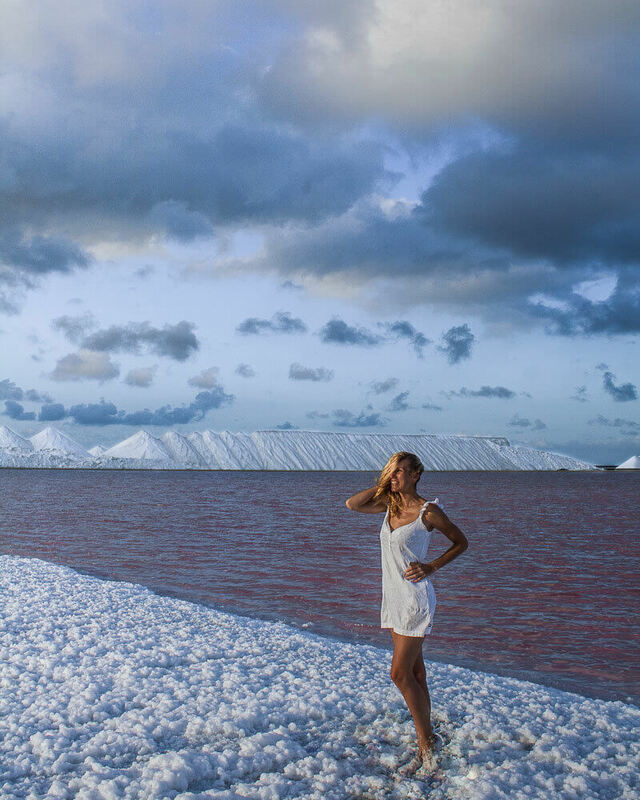 Whatever you do, Bonaire will leave you awestruck. Last year I went on a big dive trip to Malaysia. So, this year I really wanted to explore some more awesome places in this world. Of course, there are still the most famous ‘Raja Ampat’ or ‘Sipadan’ in Indonesia or the Bahamas on my bucket list. But you can’t do it all at once and I felt like I should save some of the gems for a later point. 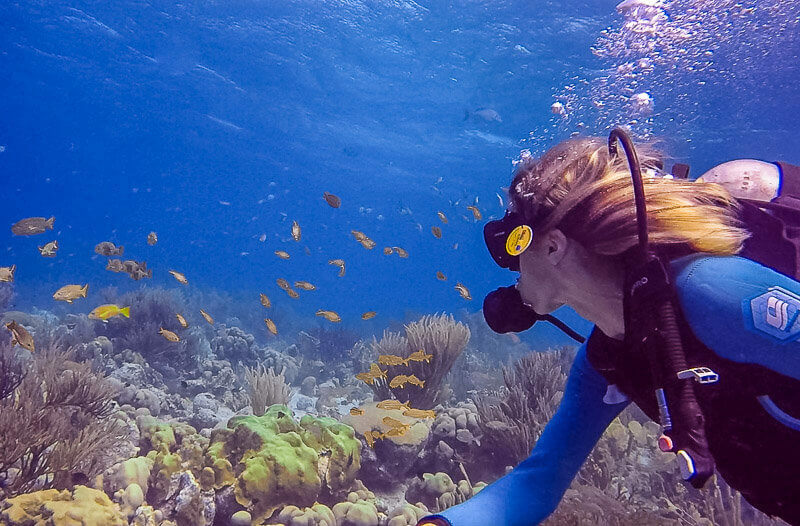 Bonaire is known for its unlimited dive packages. This basically means you pay a fixed price and get unlimited dives within a defined period of time. I got a 6-day dive package including 3-two-tank boat dives. 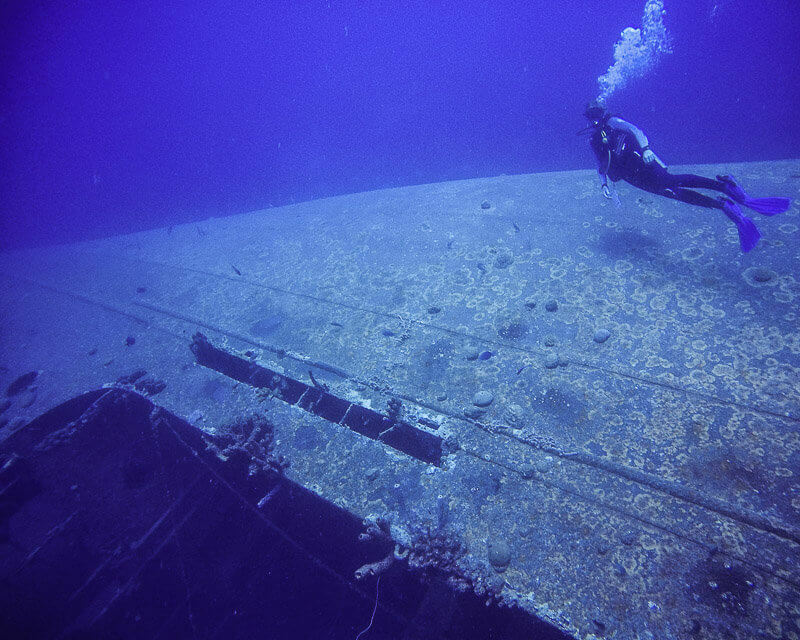 Great dive spots to not miss out on are ‘Salt Pier’, ‘Salt City’ and ‘Hilma Hookers’, an amazing wreck. There are several dive shops on the island. I chose Dive Friends Bonaire as they have, in contrary to the others, 7 dive shops on the island where you can pick up your air tanks. Of course, you can also dive right at the locations. For solo travelers, there are lists at every location where you can enter your contact data and get in touch with other divers to find dive buddies. One of my dive buddies and his wife had this amazing project where they make it possible for disabled people to experience the wonders of diving. I don’t even know where to begin when talking about diving on Bonaire. The variety of fish is amazing. You will find all kind of different colors, big school of fish and a lot of trumpet fish which are really funny as you always find them in a vertical hovering position in the water. On top of that, I saw eagle rays which always look so graceful in the water. The absolute highlight though were seahorses, an orange and a black one. Especially the black ones are really rare and seahorses are extremely hard to spot in general so that was an incredible experience. The Washington Slagbaai National Park is definitely worth a visit. Get ready for a ride through the desert with meter high cactus plants surrounding you before you get to the shore with big cliffs and the view of a never ending ocean. Watch out for Iguanas who will hang out on the gravel roads and run away in the funniest manner when you’re approaching them. Take a swim in blue lagoons and beautiful beaches. Or even take your dive gear and go diving at some more dive spots. Your highlight will be of course the number of flamingos you will spot on the way. There’s an entrance fee that is already covered with your STINAPA tag you will need to get at some point anyway. It’s a nature fee of 25$ that needs to be paid and is valid for a year. One night I was lucky to attend a local ‘Reef Talk’ from the Coral Restoration Foundation Bonaire. The foundation monitors the reef’s level of health and plants and grows corals. We all love beautiful colorful corals. Unfortunately, corals are facing major threats such as warmer and more acidic oceans. These can severely harm the corals and destroy entire reefs. That would have a direct impact on the tourism sector, the fishing industry and medical research fields. So what can we do to prevent this from happening? We can watch our carbon footprint (and yeah, mine is also not the best due to a lot of flying). We can also watch that as little pesticides as possible enter the ocean, e.g. only using reef-friendly sunscreen without harmful ingredients like oxybenzone (and no, I am also not a pro on that yet). But I think it’s a good start to whenever we do something think further what impact our action will have on the world. I am not perfect myself and I am not lecturing, simply setting some triggers. If you want to get an even more local vibe I can highly recommend attending a yoga class with ‘Yogarriba’. I attended her sunset yoga class. It was such a perfect way to end the day and to allow yourself to be in balance with your body and mind. I have to say normally I get a bit passive-agressive when practicing yoga. I guess you always gotta stay open though. In the end, the teacher was so amazing that I was able to completely relax. I met wonderful people that evening since the class is mainly for locals. Ed, the Thai Chi master, ended my night with a very positive vibe when he turned to me and said: ‘You added a lot of grace and joy to our little group. Thank you very much, Lisa for participating and being here tonight.’ And you can say what you want and find it overly spiritual but I guess hearing words like that is something that always adds comfort and positivity to your inner mental state. The same teacher who does the yoga classes also offers ayurvedic massages. It was a real unique experience. Leaving my apartment driving to a church opposite of a gas station where we were supposed to meet, I felt slightly weird. After already ringing the bell at a random house an old man opened the door. My ‘Hi I am here for the massage!’ was answered with a ‘…well, not with me dear.’. And then I saw her arriving at the parking lot. She just wanted to guide me the way to the infamous ‘earthship’. 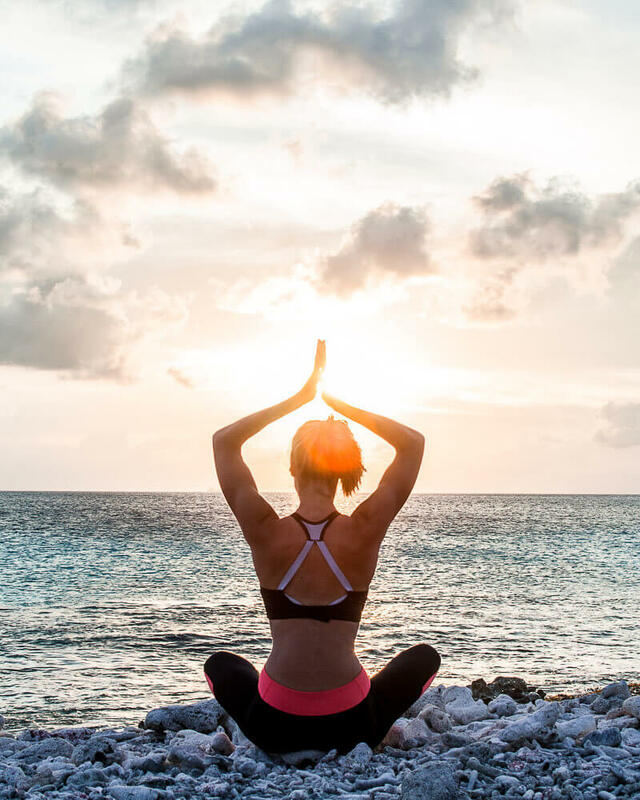 A yoga temple she and her partner have built-in the desert of Bonaire. This is where I was going to have my massage. I think I don’t have to stress how relaxing THAT was with absolutely no one around. Oh you wonderful island, thank you for all the hours that I spent in happiness and excitement. Thank you for all the wonderful people I got to meet, locals and fellow travelers. And thank you once again for allowing me to completely be in balance with myself. It’s the magic of traveling solo every once in a while that allows you to reach new levels and discover unknown potential within you. Whenever I go out in the world by myself I reach a point where I feel so empowered and satisfied that no negative thought can really touch me. I can only share my stories and hopefully inspire some people to be brave to go out and discover every possible inch of the world. As you will ultimately discover so much about yourself that you will have a hard time to process all those wonderful thoughts and feelings at once. This may sound very cheesy. 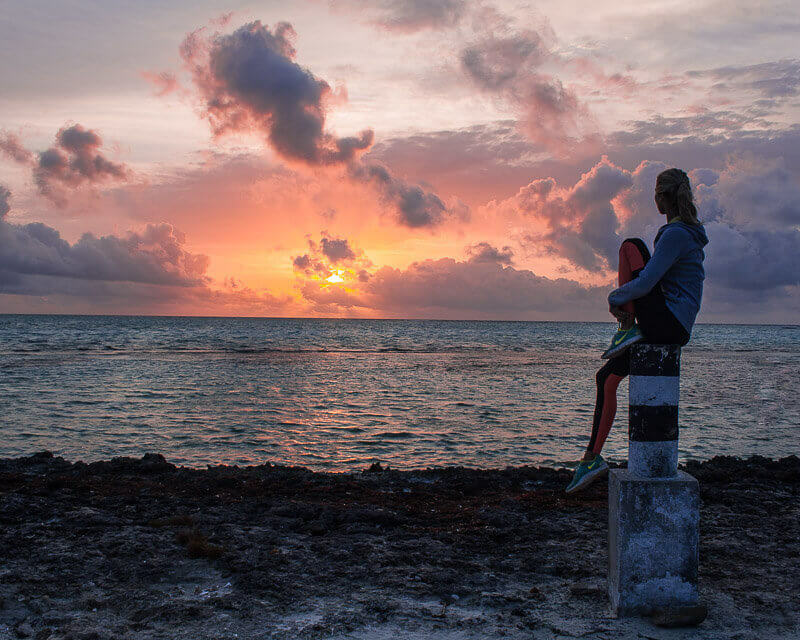 But on my last day of my Bonaire adventures I got up to watch the sunset. There was no one around and I seemed to be the only person awake. And while the sun was rising and two flamingo babies decided to make an appearance I think I was smiling for an hour straight. Those peaceful moments are something that no one can take away from you and that enlighten you. It’s those moments that have driven me to take all kinds of different, sometimes silly but every time wonderful, actions in my life. It’s those moments that keep pushing me and keep allowing me to be brave. It’s that simple magic of feeling so alive that you cannot wait for all the adventures that are awaiting you.